This paper is about the use of control algorithms to animate dynamic legged locomotion. Control could free the animator from specifying the details of joint and limb motion while producing both physically realistic and natural looking results. We implemented computer animations of a biped robot, a quadruped robot, and a kangaroo. 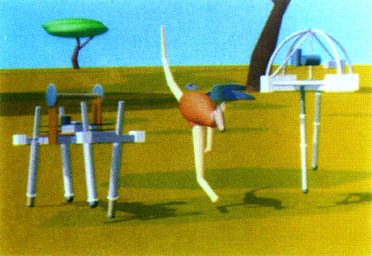 Each creature was modeled as a linked set of rigid bodies with compliant actuators at its joints. Control algorithms regulated the running speed, organized use of the legs, and maintained balance. All motions were generated by numerically integrating equations of motion derived from the physical models. The resulting behavior included running at various speeds, traveling with several gaits (run, trot, bound, gallop, and hop), jumping, and traversing simple paths. Whereas the use of control permitted a variety of physically realistic animated behavior to be generated with limited human intervention, the process of designing the control algorithms was not automated: the algorithms were "tweaked" and adjusted for each new creature. Marc H. Raibert, Jessica K. Hodgins (1991). Animation of Dynamic Legged Locomotion. Computer Graphics / Proceedings of SIGGRAPH, 25(4), 349--358.